'C' Company, No. 11 Platoon. 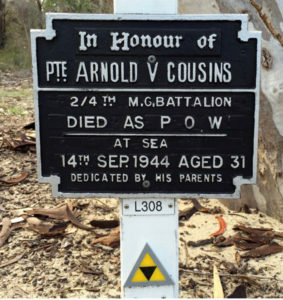 Epitaph, Labuan Memorial, Panel 18, Age 30. Victoria Point, Kendau 4.8km, Thetkaw, Khonkan, Meiloe, Augganaung. A Climie, A Cousins, D Squire, A Miller, A Minchin, V Dewar, Brambles. Millar and Cousins during stopover in Sydney. Both men were in ‘C’ Company however Millar was unable to re-board ‘Aquitania’ when it sailed for Singapore from Fremantle on 16 Jan 1942 and was sent to Java. He survived. Arnie Cousins was selected in Singapore to work on the Burma-Thai Railway with ‘A’ Force Burma Green Force Battalion No. 3. Read further about Green Force. When the railway was completed the IJA moved all the POWs who had been working in Burma south to Thailand. Many including Arnie Cousins were evacuated to Tamarkan. It was here he was later selected on 27 March 1944 to work in Japan and following health injections was sent by rail via Bangkok to Phom Pehn, Indo China (now Vietnam). Here the POWS left the train (end of rail line) and made their way to Saigon. The men of ‘Rakuyo Maru’ party spent weeks working around the docks before the Japanese decided the American sea blockade was too effective and they were unable to sail for Japan from this coastline. The ‘Rakuyo’ group was then sent to Phom Penh to return to Singapore by rail via Bangkok. The men were accommodated in Singapore at River Valley Road Camp waiting for their ship ‘Rakuyo Maru’. It was about 5 months since first being selected for this work party! Eventually the POWs sailed out of Singapore just a few days prior to being hit by torpedoes from American Submarines. 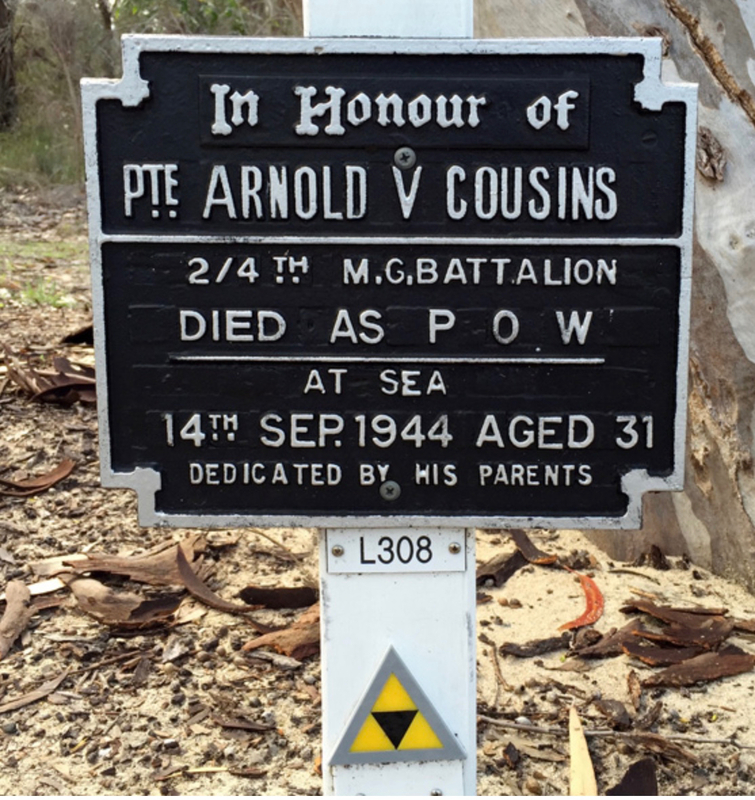 Arnie Cousins died aged 30 years. Arnie had previously served with 10th Light Horse Militia Service No. 319924, prior to joining AIF in October 1940. Sister Phyllis married in 1941. Daisy being one of Arnie’s three sisters. Daisy was a very active member of the Mt Helena Community. Arnie’s father William was an orchardist in Mt Helena. William and Clara had a family of 3 daughters and 2 sons. Prior to enlisting Arnie was living in Mt Helena and his occupation was Baker. The Cousins family appear to have been active in the community. Mt Helena was initially a saw-mill town, however after the mid 1920s, became known for fruit producing. William Cousins died at East Victoria Park in 1961 and his wife Clara died in 1965. They were both buried at Karrakatta Cemetery.